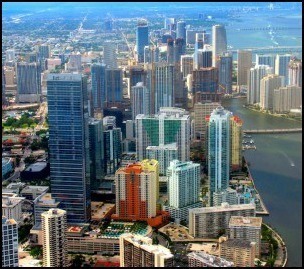 Downtown Miami is an urban neighborhood in Miami, FL. This area is a commercial, cultural, and financial center of South Florida and is one of the fastest growing areas in South Florida. As a result of an abundance of high rise residential and business building, many shops, restaurants, and parks have been established for the convenience of the residents. At every corner there are mom and pop shops serving all cultures and appetites. Walking is the easiest mode of transportation, but on the lazy or rainy days, the Miami Metrorail and the Metromover are available for your use. Downtown is bordered by 6th street to the north, Biscayne By to the east, and the Miami River to the west and south. The central area is where you can find the majority of the schools, parks, museums, libraries, and government offices. Downtown is also home to many venues for entertainment such as Bayside Marketplace where you can find many other restaurants and shops, the American Airlines Arena, and the Performing Arts Center. Downtown Miami is a cultural hub of excitement. Downtown Miami is only minutes away from South Beach and everything that it has to offer. Spend the day enjoying the beach or exploring all of the shops and lavish restaurants in the area. The airport is only a short drive away, which makes traveling easy and convenient. The lifestyle provided in Downtown Miami cannot be rivaled. The perfect weather, amount of attractions, and luxurious homes create a one of a kind experience. Brickell is a neighborhood in Downtown Miami that is the financial district of the city. The neighborhood is made up of luxurious high rise condos and has the largest concentration of international banks in the country. Brickell Ave is home to many famous restaurants, shops, and venues for entertainment. Walking is the easiest mode of transportation because everything is so close, but on those rainy days, the Miami Metrorail and the Metromover can help you get around. The places to go and see in Brickell are endless with the Mary Brickell Village, which houses an assortment of boutiques, services, and restaurants. The area is lushly landscaped to make you forget that you are in the middle of a bustling city.